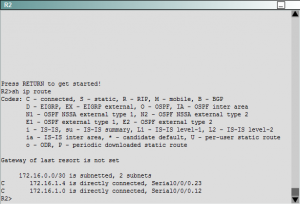 Cisco has created a very good demo exam which resembles the real simulation used in the CCNP TSHOOT exam. While the trouble tickets asked in the demo are nowhere near the real TSHOOT exam it gives an idea of what kind of tickets to expect in the exam. 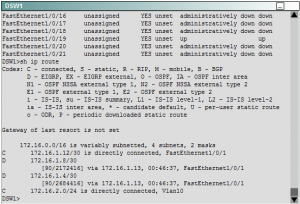 This article is a walkthrough on how I answered the 4 tickets in the CCNP TSHOOT demo. The 4 tickets in the demo jumble up each time the demo is opened so the order of tickets I mention in this article will be different compared to the one you’ll encounter in the demo. 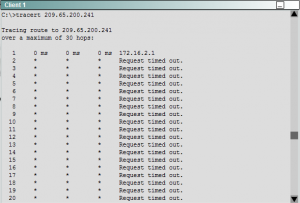 All tickets contain the same issue of the client not being able to ping the webserver so you can differentiate each ticket based on the output of tracert. 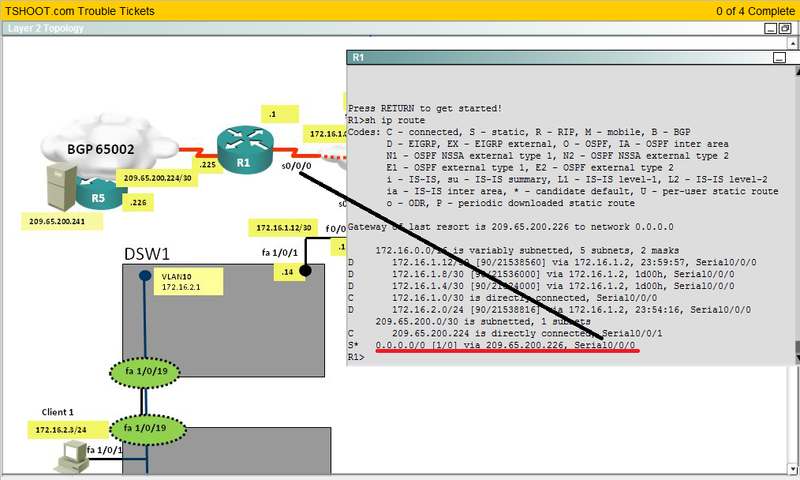 Open the IPv4 Layer 3 topology, click Client1 and do a tracert to the web server. 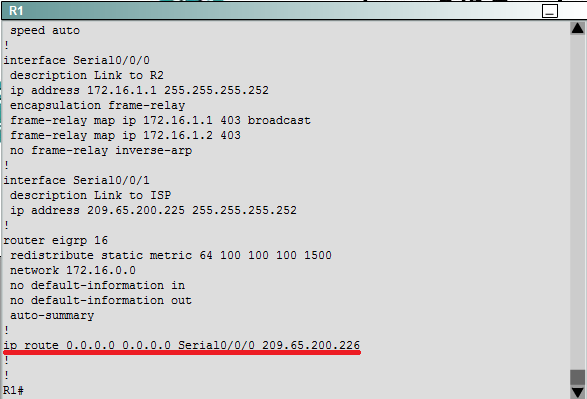 The tracert output from client 1 stops at the IP address of R1 as shown below. 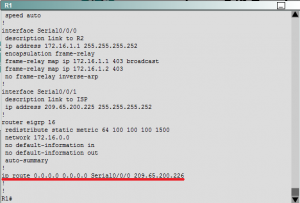 So lets open R1’s console and have a look at the routing table. Looking at the last line which is a static route (denoted by “S”) which is also the default route (denoted by *) has a wrong interface specified. 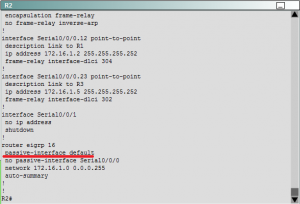 As shown in the “Layer 2 Topology” below interface Serial0/0/0 connects to router R1 and NOT to the cloud. The running configuration below contains the incorrect static route configuration. On which device is the fault condition located ? The fault condition is related to which technology ? What is the solution to the fault condition ? After opening this ticket run tracert again from “Client1” this time packets stop at the gateway, the DSW1 multilayer switch. 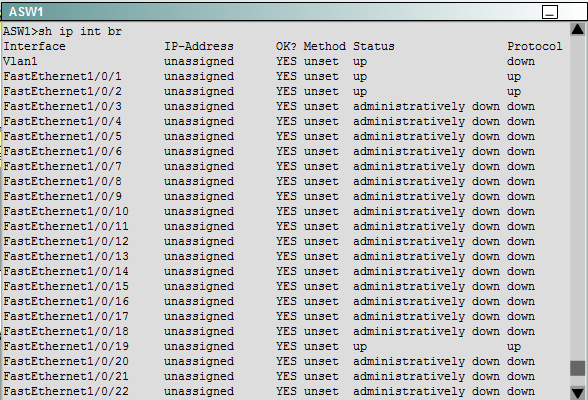 Opening the console of DSW1 lets start doing a bottom-up troubleshooting approach by checking the interface status. 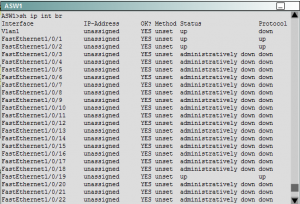 We find that the interface FastEthernet1/0/1 is “down” but not administratively. This means no one purposely entered the “shutdown” command in that interface mode. From the “Layer 2” topology we can find that the interface FastEthernet1/0/1 is connected to the router R4’s FastEthernet0/0. Open R4’s console and check the interface status. 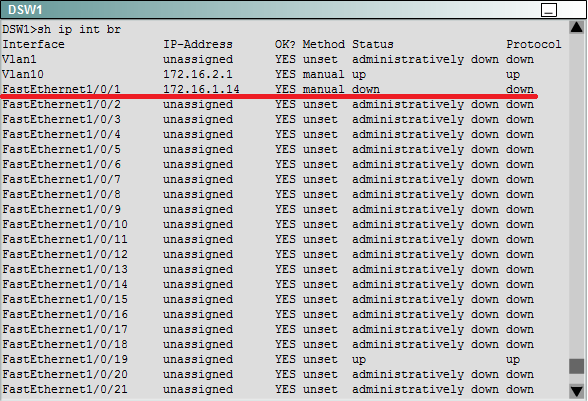 We can find that the F0/0 interface is administratively down as the “shutdown” command was present in that interface. In this ticket tracing the web server doesn’t get a reply even from the gateway which means there is something between Client1 and DSW1 which is blocking traffic. Looking at the “Layer 2” topology we can find an access layer switch ASW1 which I assume is causing the problem. Opening the console of ASW1 lets use the bottom-up method and check the status of the interfaces on the switch. All required interfaces are up, so what do we do next ? 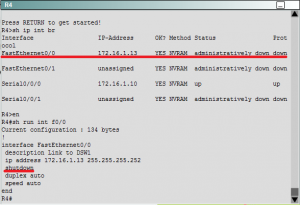 move on to the next layer and check if the interfaces are in the correct VLAN. 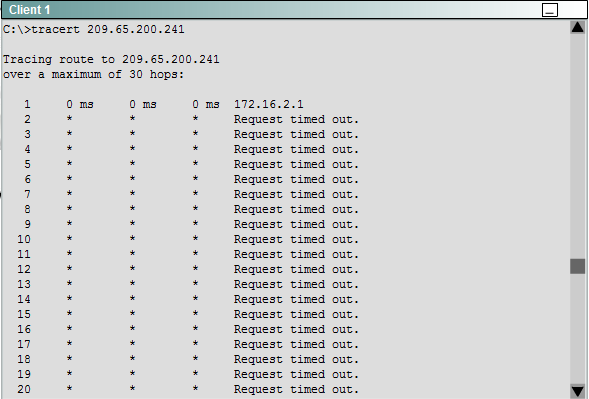 The interfaces connecting to the clients are in the correct VLAN. 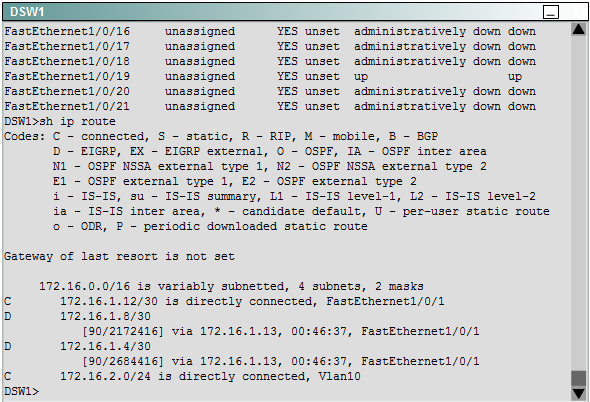 Interface f1/0/19 is not listed because it is trunking, so we’ll proceed be checking its config. 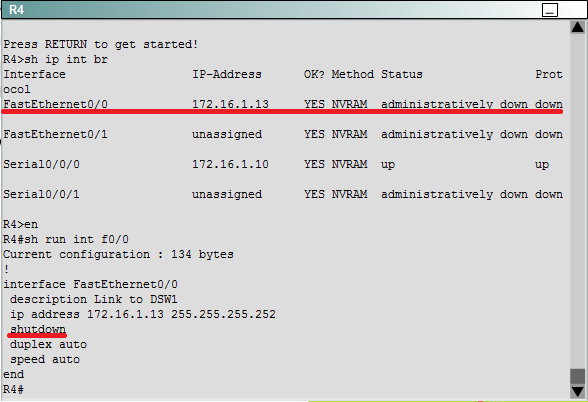 Using the “show interface trunk” command we find that trunking is properly enabled and the required VLANs are allowed. While checking things like trunking it is best to check it on both sides to be on the safer side, check the trunking configuration of DSW1 too. Now this reveals that the culprit is the interface trunking on DSW1. 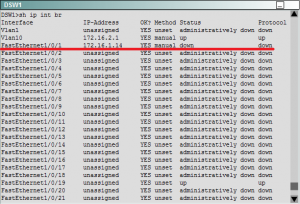 It allows only VLAN 98 over the trunk, so the absence of VLAN 10 is what causes communication to the gateway IP address fail. In this final ticket doing a tracert from client 1 returns an output similar to the one shown in “Ticket 2”. 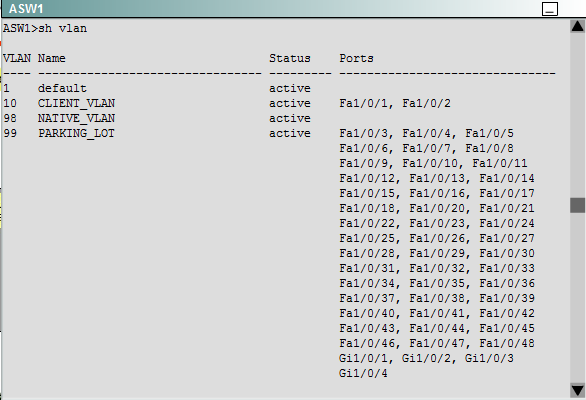 You might get this ticket first so you better start troubleshooting by checking the interface status of DSW1. After confirming this lets move on to layer 3 and have a look at the routing table. 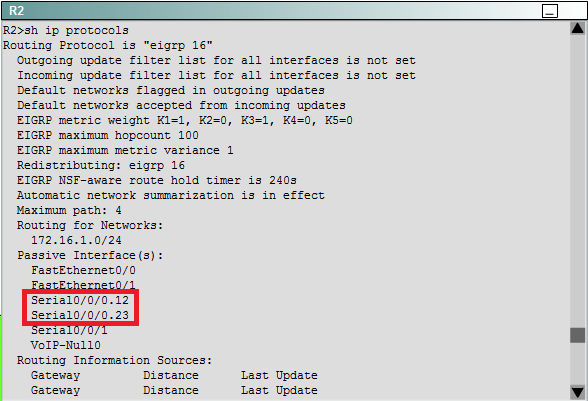 Looking at routing table we can find only two routes (172.16.1.4/30 and 172.16.1.8/30) were learned through EIGRP (denoted by D). The route that comes above R2 is not present. This could indicate route filtering applied (on R4 or R3) which filters out this route or a lot of other problems. But rather than looking at each of these individually I prefer using the “shoot from the hip” method and have a look at R2 itself. What if the interface between R2 and R1 is down ? 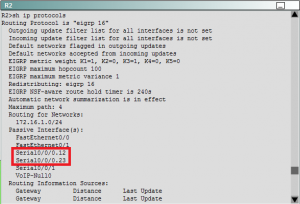 What if EIGRP is not running at all ? Lets open the console of R2 and check the routing table. 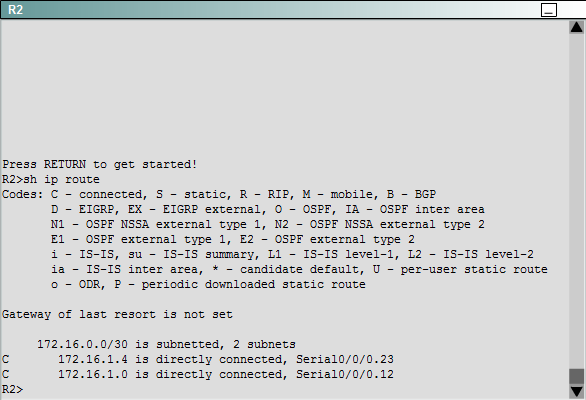 We can find that not a single route learned from EIGRP exists. 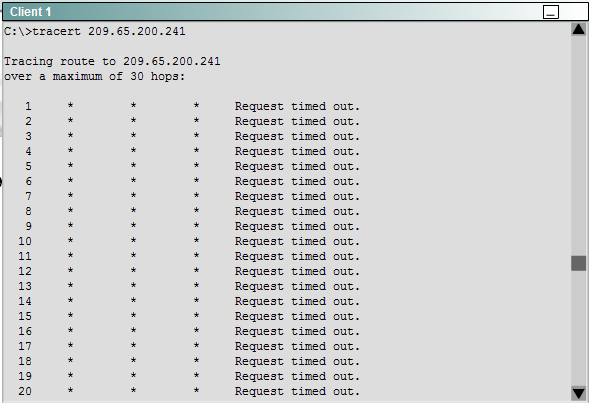 Now to check if at all EIGRP is configured use the “show ip protocols” command. 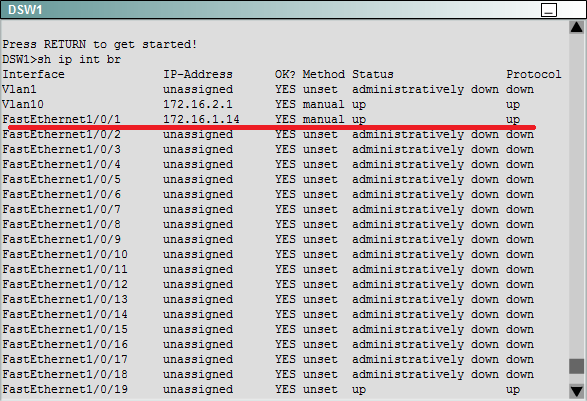 We do find EIGRP 16 configured, but looking at the passive interfaces we can find that the frame relay sub interfaces Serial0/0/0.12 and Serial0/0/0.23 listed under them which is the cause of the problem. Looking at the running-configuration confirms the presence of the “passive-interface default” command. These are the methods I used when doing this demo exam but you can use a number of other methods based on your creativity. Do leave a comment on the methods you used in this demo exam. How many tickets are you getting wrong? The tracert output of two tickets are the same but the solution is different. Maybe you mixed up those. I think it is just a DEMO EXAM which not give you Proper Information as the real one ? You’ve troubleshooted it correctly. The solution for this problem is explained in the Ticket 3 of this article. If i troubleshooted it correctly. So why it’s showing me that I answered 1 out of 4 for this correctly. Please Explain and figure this out on the link mention below. You reply highly appreciated. I want you to troubleshoot it and see what happens you got the same as mine ? The demo seems to tell the number of tickets completed. When I finish the first ticket it says 1 out of 4, completing the second ticket says 2 out of 4 and so on. So this message doesn’t seem to indicate the number of correct answers. If it were to tell that it should say 1 out of 3 questions because each ticket has only 3 questions. The demo doesn’t seem to show if you answered correct or not. So the only way to check that is by using the “Abort” approach by Kevin Wallace. You open a ticket, find out what is wrong then hit Abort. Open a new ticket and check if the previous incorrect or missing command is fixed here. I appeared for CCNP TSHOOT 642-832 today and missed my chance. I would like you to clarify some doubts, so that I can appear again. Suppose to answer 12 out of 13 tickets. Is there any order to be followed in selecting tickets. How to identify the trouble for 12 tickets. Your help is highly appreciated. There is no particular order to follow but remember to click “Abort” if you’ve decided not to solve it at that time. 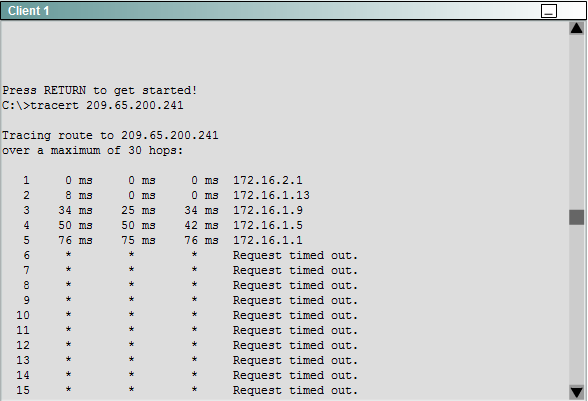 I troubleshoot be starting with a traceroute and then ping to identify the device causing trouble. Also familiarize yourself with the L2 and L3 structure of the topology. All the best for your next attempt!!! You can’t, each ticket is different and the numbers are reordered each time you try the demo. When a ticket is selected the config of all devices change as per the problem in that ticket. So one ticket/solution does not affect another. ‘passive interface default’ and on the next line ‘no passive interface serial0/0/0′ . Yes but each sub-interface has to be specified for it to be excluded. 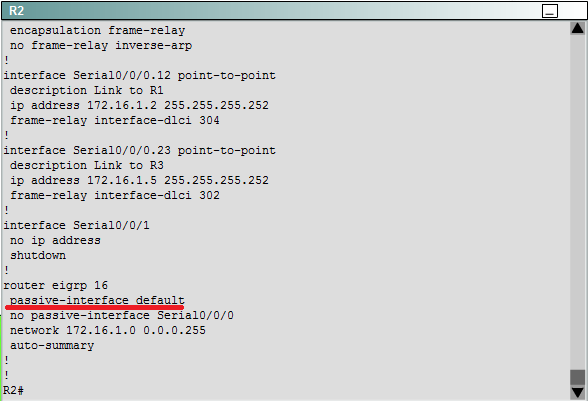 Try “show ip protocols” on R2 and you’ll find that these two sub-interfaces are passive. The no passive interface on the physical does filter down. Then why does show ip protocols list those two subinterfaces under “Passive interface(s)”? It worked for me and I was able to ping as I when I corrected the faults on the other tickets. You’ll be able to ping even if you choose the wrong answer for any ticket that’s how the demo works. 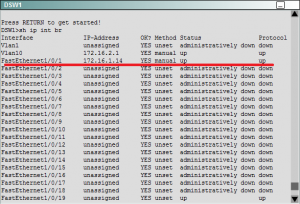 Try looking at the running config at this point you’ll find auto-summary and without any passive-interface command under router eigrp 16. Auto summarization advertises a single classful route instead advertising each classless route, official explanation. The passive interfaces is the correct solution to this ticket. You cannot go back and “test” your fixes in this demo, nor in the exam. 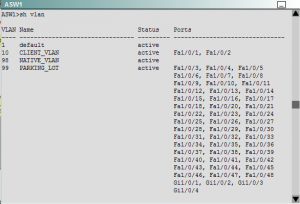 Once a ticket is closed/completed the configuration of the topology is essentially invalid. The config gets adjusted on when a ticket is open, for that specific scenario. 1. 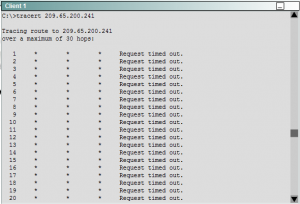 Can we even use the tracert-command on the client in the exam? 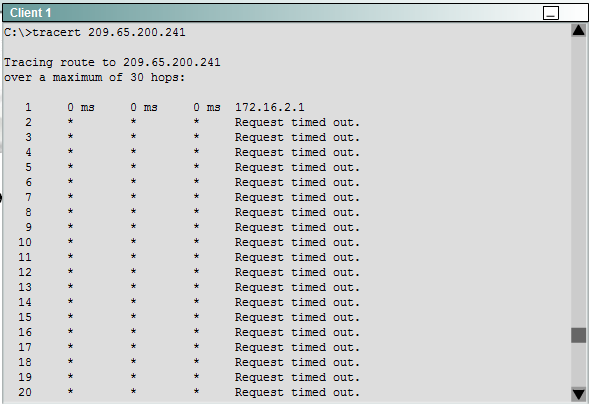 I thought you can only use the traceroute command on the DSW1 etc. 2. 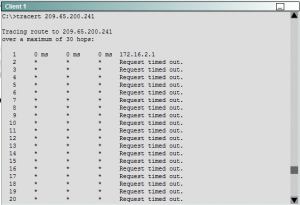 Can you use the “traceroute IP-Address source IP-Address” in the exam or does this not work?